This post continues the story of Charles Daniel Wedge, compiled by volunteer, Lisa Gibbons. 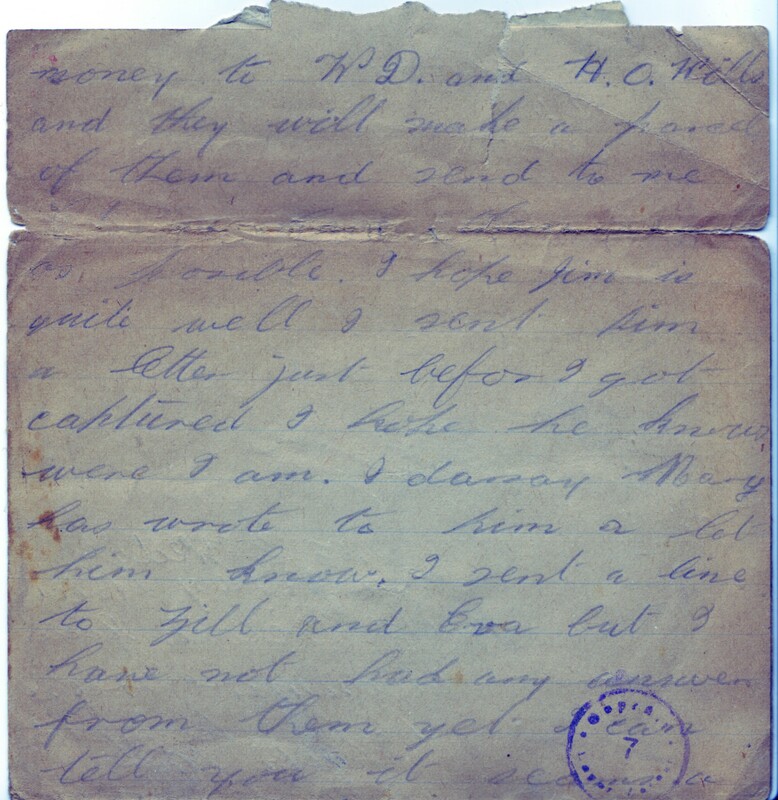 Charles’ first letter (in the previous post) was by far the longest communication that was kept (by Mary Jane), no doubt Daniel sent other letters to his married sisters and Mary Jane who had moved back to her childhood home in 1916 following the sudden death of her mother Zillah. She kept house for her father and youngest sister Fanny who was only fourteen at the time. Mary Jane’s own husband was fighting with the 1/6th South Staffords in France at the time. 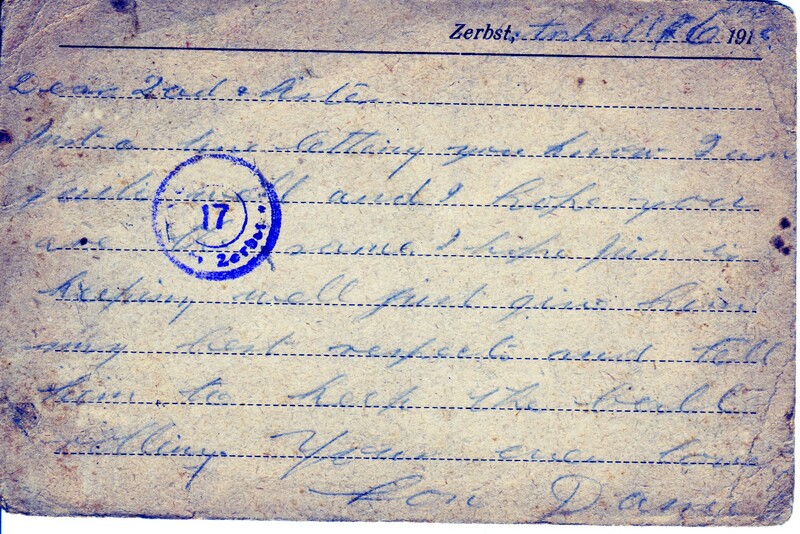 This and the following cards are addressed from Zerbst (Anhalt) – a Mannschaftsgefangenenlager (a soldier’s camp, as opposed to an officer’s camp) situated in the centre of the triangle formed by Hanover, Berlin and Leipzig. 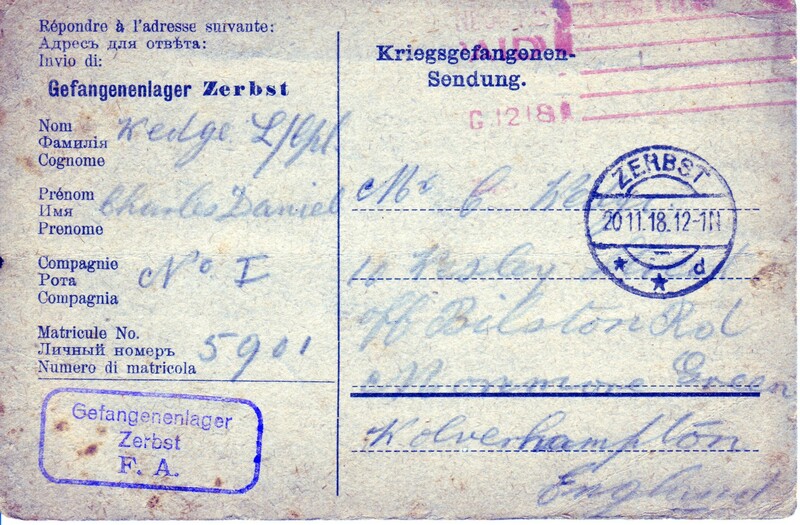 It is pre-printed with the word Kreiggefangenen sendung – which roughly translated means “Prisoner of War Mail”. Just a line letting you know that I am quite well and hope you are the same. I hope Jim is keeping well just give him my best respects and tell him to keep the ball rolling. One week later, dated 21st October he sends a card with similar sentiments, under the date he writes “Germany”. The Express and Star Newspaper and Dumbell’s Comfort Fund hosted a dinner at Heath Town Baths and entertainment for the returning Prisoners of War in 1919 – Daniel’s name is on the Roll. 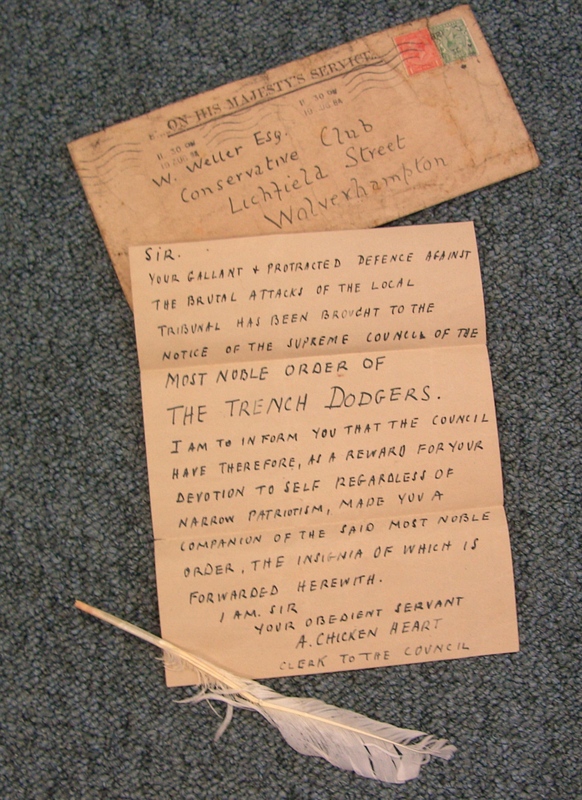 The document is kept in Wolverhampton Archives. 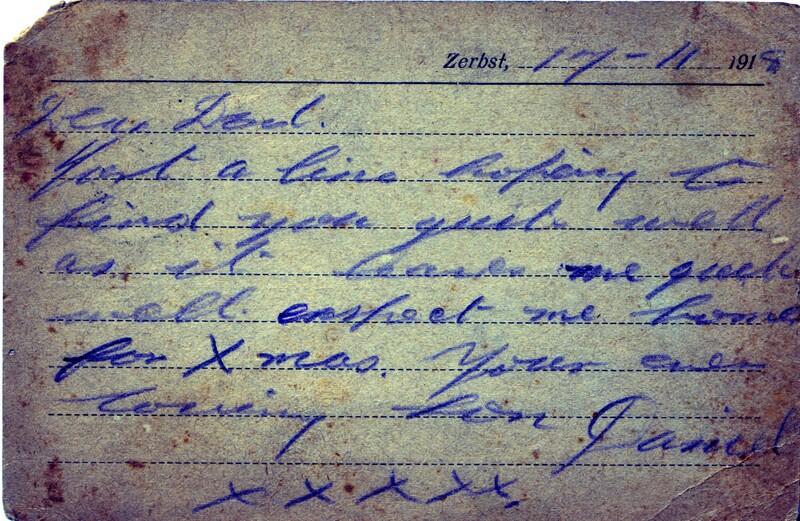 However, on 17th November he wrote this rather hurried card, brief and heart breaking. The excitement is actually visible in the rushed handwriting! Charles Daniel Wedge returned home to Wolverhampton, he married, raised an extensive family and died on 10th February 1963. This post has been contributed by one of our volunteers, Lisa Gibbons. Charles Daniel Wedge was born in Ettingshall Bilston around 1898. His parents Charles Richard Wedge and Zillah Lippett had married at St Matthew’s Church on 9th June 1899. Charles Richard (known as Richard) was relatively local, having been born and raised at Gospel End, near Sedgley. His mother Zillah was born in Felton, Herefordshire and had been in service to a family in Kidderminster prior to moving to Ettingshall. Charles Daniel, known as Daniel, was the only son of Richard and Zillah, can be found living with his parents and sisters Evelyn, Zillah, and Mary Jane in the 1901 Census at 10 Westley Street. 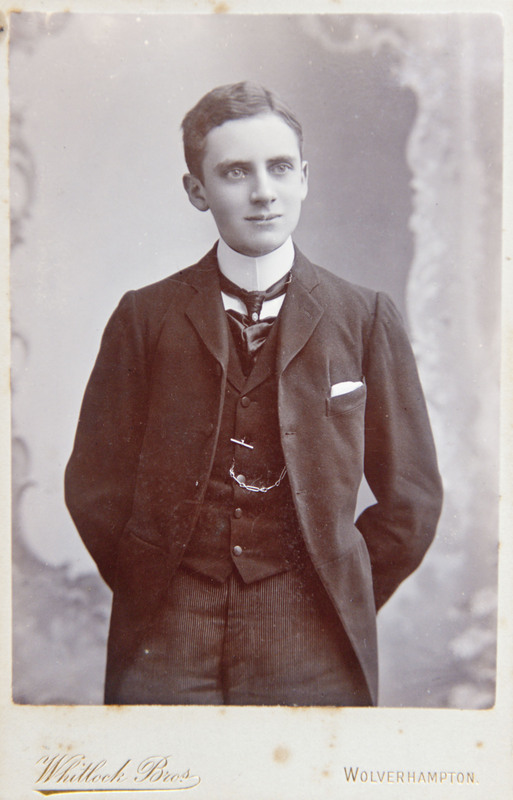 Daniel was only two years old – his parents would add a further daughter, Fanny, to their brood in March 1902. There are no records of attestation paperwork for Daniel. His war medal record sheet shows that he fought in the Machine Gun Corps (60008) and the Royal Field Artillery (295299). 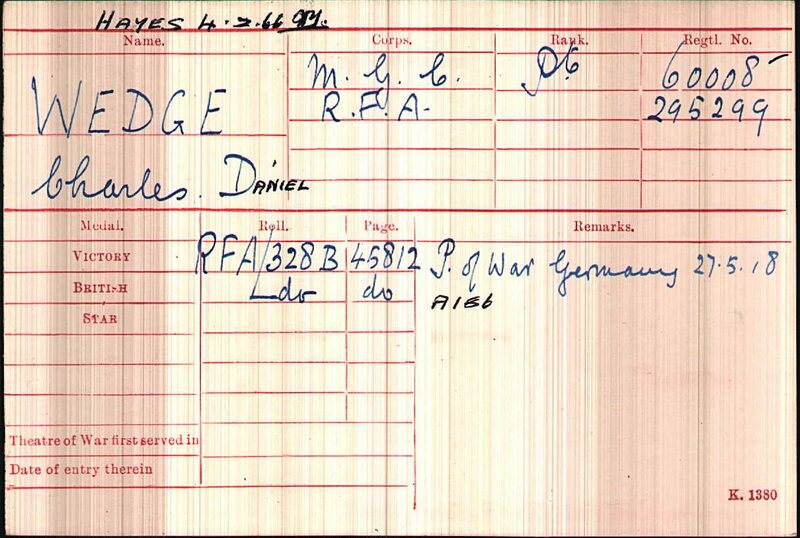 The other interesting point is that Charles Daniel Wedge was taken Prisoner of War on 27th May 1918. 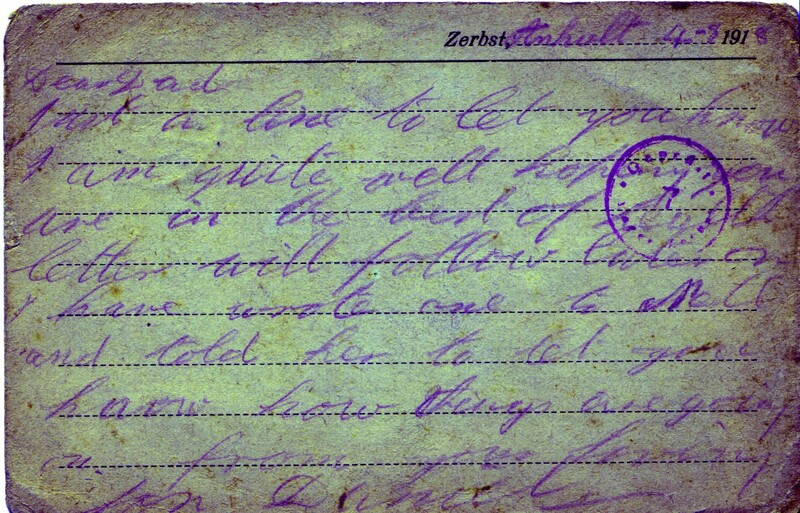 The following letter and cards were sent to his father, Charles, and sisters during his imprisonment. They were found in the 1980s in the box of photographs and cards belonging to his sister Mary Jane Wedge (who married James Maddocks). 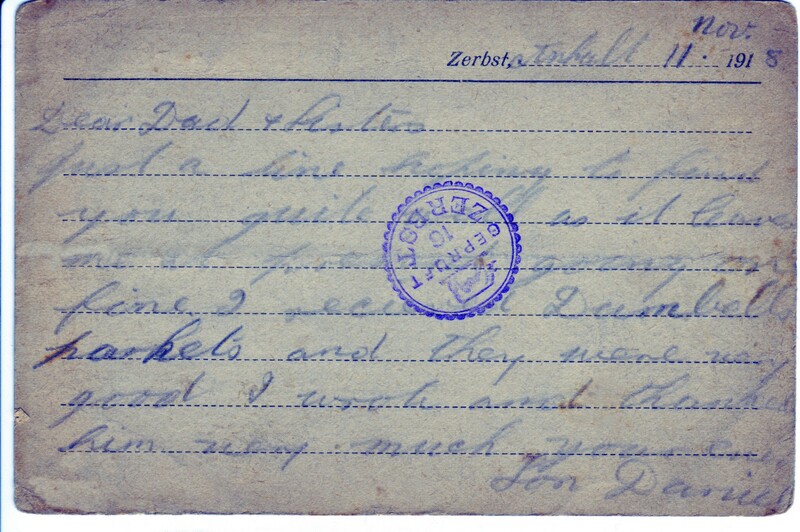 Captured soldiers had the right to send two letters (of no more than four pages, though officers could write up to six pages) and four postcards per month. 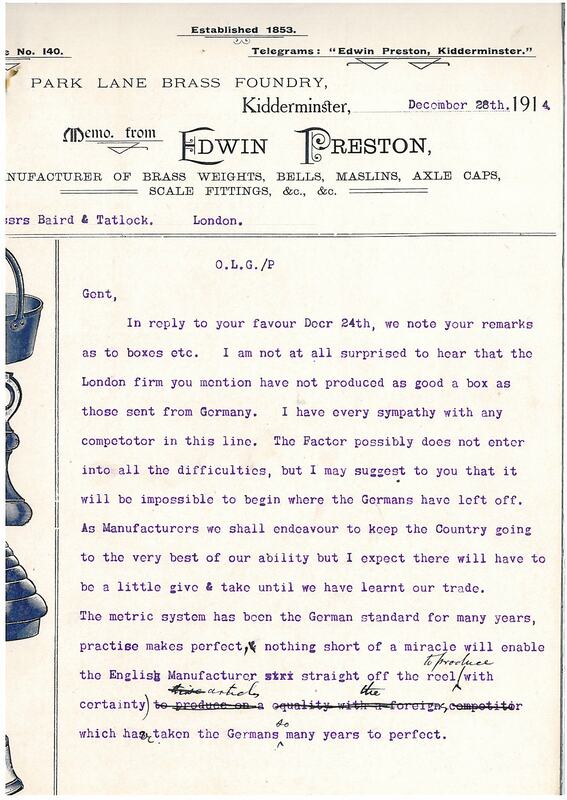 The stationary had to be purchased at the camp – and though these were the regulations the pressure of this mail caused the German captors to regularly withhold the sending and receiving of mail. How different this is from today’s instant communication. The postcards that follow are just a little longer than a Twitter maximum length. How would today’s twenty years olds feel if they could only send four text or twitter messages a month? Just a line to let you know I am feeling quite well and I don’t want you to take it hard over me being here for I shall take of myself. Will you let Nell know as soon as possible where I am for we can only send a card now and again and when you write can you put a fag or two in the letter for they are very hard to get. I am quite well…… (unreadable, obscured and feint) Will close now…..From your son Daniel. 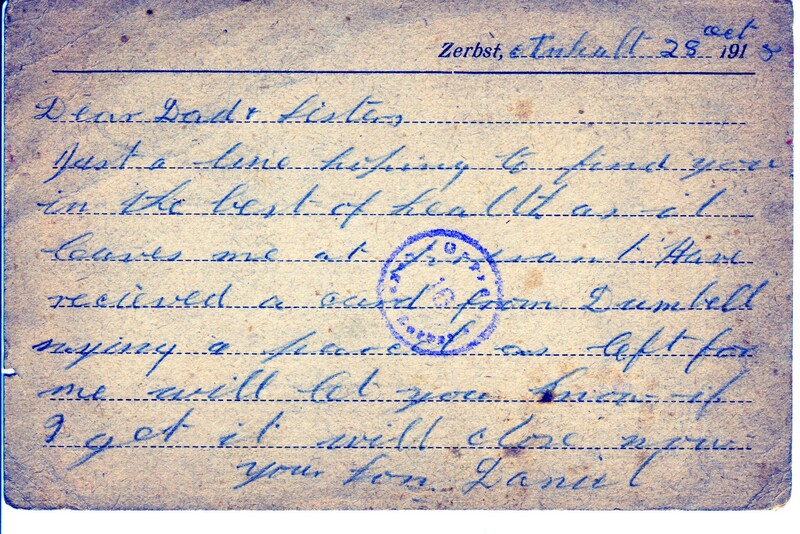 This card was sent from Langensalza Camp. It is documented that this was not the best place to be, with records of British soldiers being shot after 11th November 1918. From subsequent cards it would appear that, fortunately, Daniel was moved. 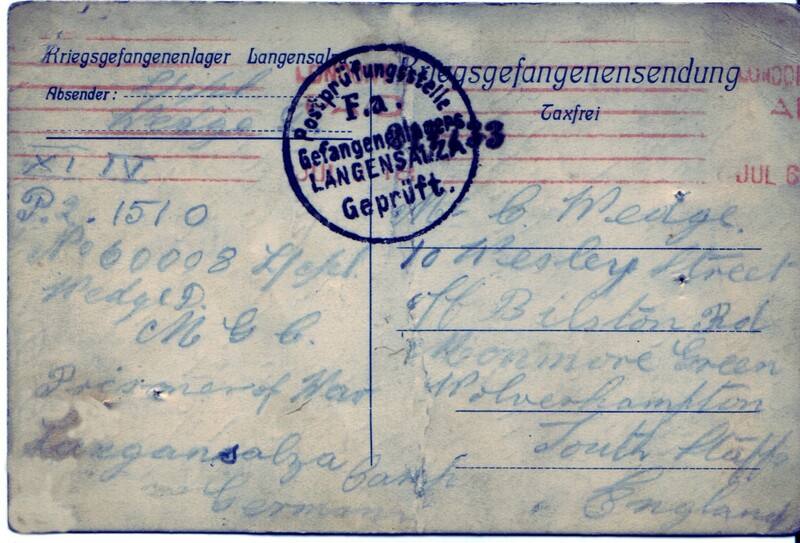 From subsequent communications it would seem that the cards could take over a month (from writing) to be stamped in London, it would take several days, possible over a week to reach Bilston. The delay in communication must have been a source of frustration when a family knew that their loved one was alive and were desperate for news. 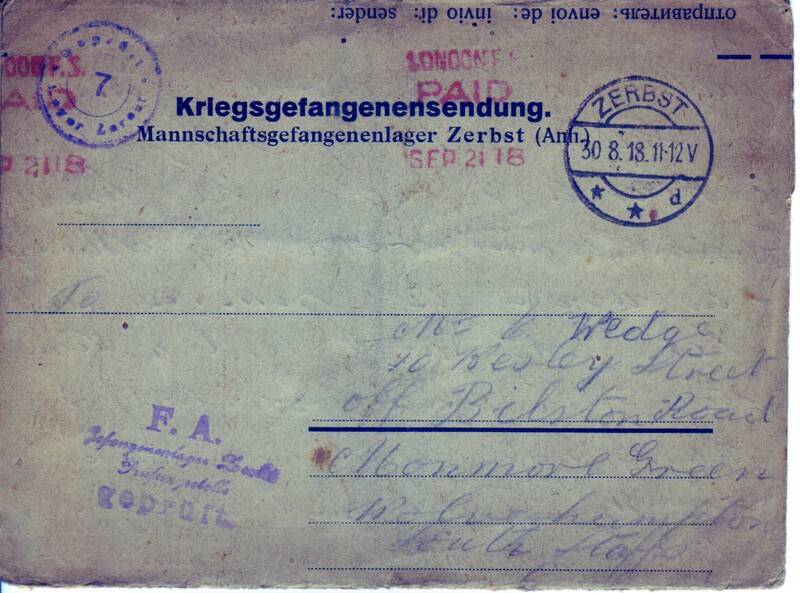 The following letter is dated 18th August 1918, the camp postmark is 30th August 1918 and the London postmark is 21st September 1918. Just a line hoping to find you in the best of health as it leaves me at present. Well Dad I would be very pleased if you would send me a few fags and I shall get them if you will send the money to W.D and H. O. Wills and they will make a parcel of them and send to me. ……………………………………….them as possible. I hope Jim is quite well I sent him a letter just before I got captured. I hope he knows were (sic) I am. I daresay Mary has wrote to him & let him know. I sent a line to Zill and Eva but I have not had any answer from them yet. I can tell you it seems a bit strange not getting a line from home for 3 months. 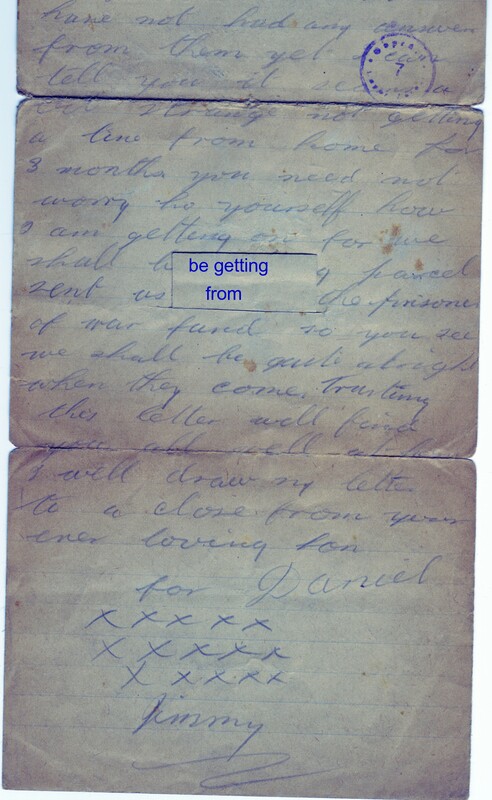 You need not worry to yourself how I am getting on for we shall be getting a parcel sent to us from the prisoner of war fund so you can see we shall be quite alright when they come. Trusting this letter will find you all well at home I will draw my letter to a close from you ever loving son, Daniel. Notes: Of course W.D. & H.O. Wills were the tobacco merchants who made “Wild Woodbine” cigarettes and as Daniel cheekily points out the company would surely make a packet and send them to him if only his dad would buy them! 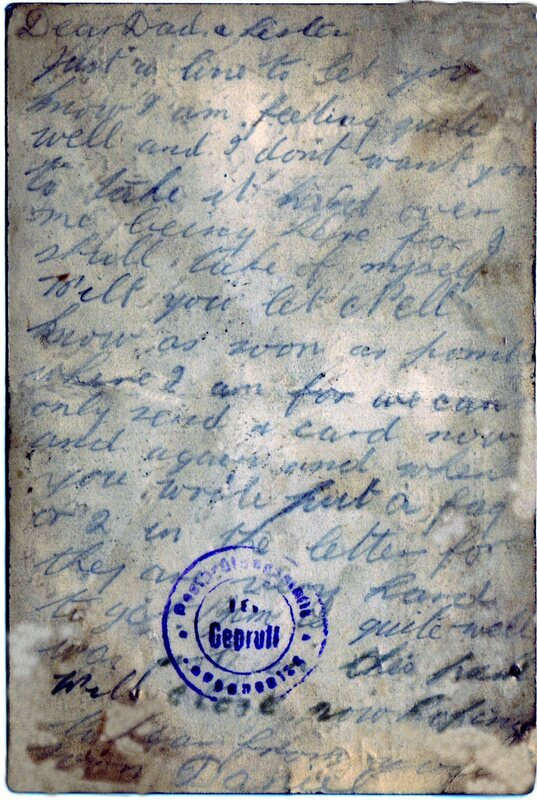 Jim is James Maddocks, his brother-in-law, (married to Mary Jane) and by the time this letter was written would have returned to the front line after suffering the effects of a gas attack (he served with 1/6th Staffords) which caused him to be sent away from the front for a short while. Zill (Zillah) his sister was married by this time and lived in Wolverhampton. Eva (Evelyn) was his oldest sister; she was married with four children, the youngest son being named Daniel, presumably after his uncle. She lived in Smethwick. The kisses at the bottom of the page are for his nephew Jimmy (James Maddocks junior). Several words have been faded (they were written in pencil) where they fall on creases and folds. Our avid volunteers, Christine Irvine and Frank Lockley (presumably no relation! ), have done some further research into the Mr Lockley mentioned in the logbook of Brickkiln Street School. The only Mr Lockley in Wolverhampton listed as a teacher in the 1911 census is a Frank William Lockley, who was 29 and was listed as an Assistant Teacher in Elementary School, living at 34 St Mark’s Road. He was born in Kidderminster and had been married for 3 years to Margaret Lockley, with one daughter called Margaret Fanny, who was aged 1. His wife, Margaret, had been born in Wigton in Cumberland, which is where the couple were married. 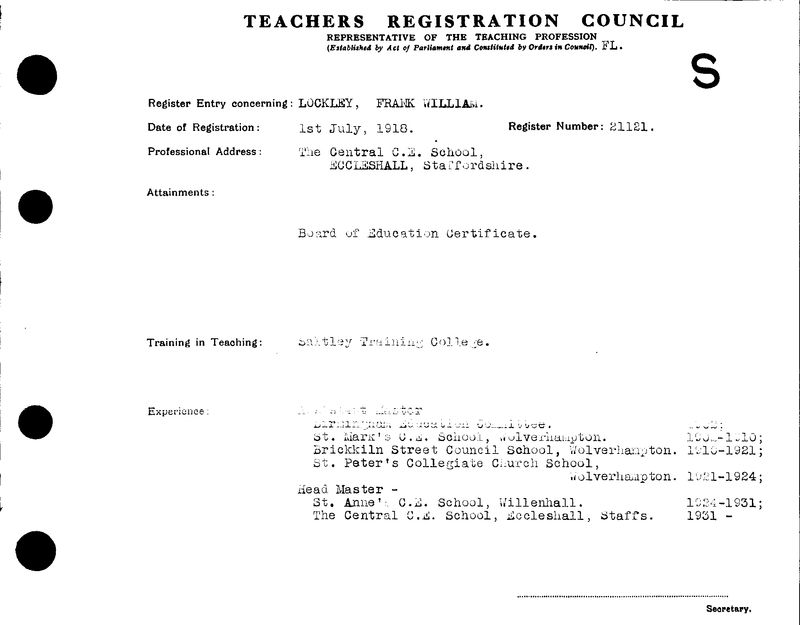 Lockley’s teacher’s registration certificate on Find my Past confirms that he worked at Brickkiln Street School 1910 – 1921, as well as at two other Wolverhampton schools: St Mark’s C. E. School from 1902 – 1910, and St Peter’s Collegiate School 1921 – 1924. The two school logbooks for the boys and girls sections of Brickkiln Street Primary School offer an interesting contrast, presumably because of the different genders of the teachers. The boys’ school is clearly more directly affected, as at least two of the teachers are called up to military service during the course of the war. 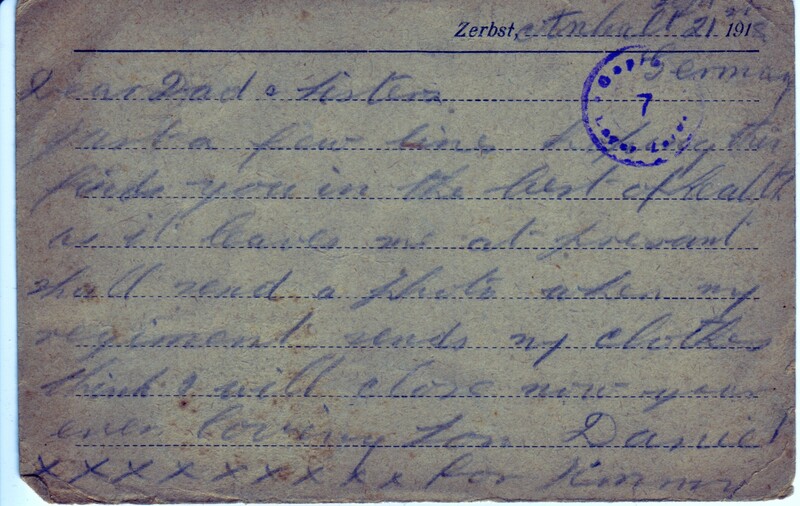 On 8 November 1915, there is a note written by the headteacher to say that “Mr Rhodes has joined H.M. Forces. St[andard] VII has now no teacher & must work with supervision from me.” Another teacher, Mr Lockley, was not called up until later on in the war, which presumably means that he was older or married or there was some other reason that disqualified him from earlier call-ups. William Weller was a partner of the prestigious firm of architects known as Weller & Sons, which designed buildings in Wolverhampton in the 19th and 20th centuries. 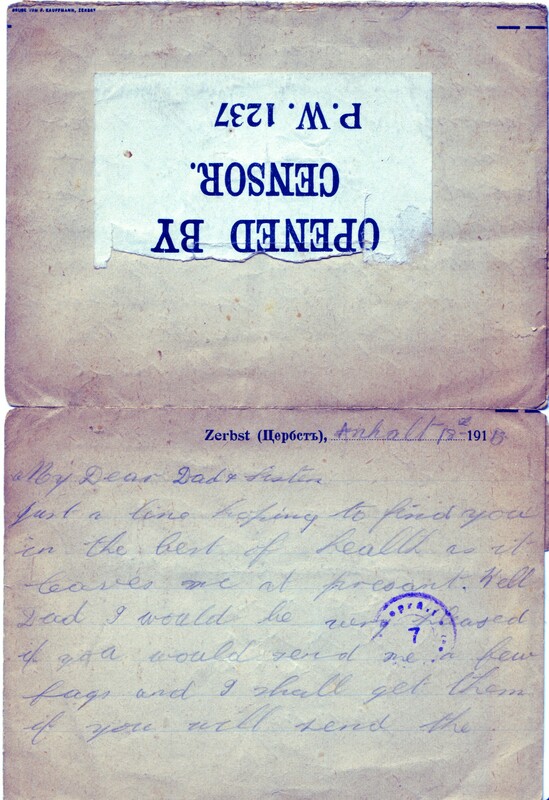 During the First World War, he was sent a white feather letter, which is one of the few that have survived to this day. White feathers were given to men thought to be dodging military service. The Order of the White Feather was founded before the First World War, and women would hand white feathers to young men who they deemed to be cowards for avoiding military service. Being solely responsible for looking after his elderly mother and poorly sister. The file of papers includes witness statements made at the tribunal, a copy of William Weller’s defence, and various correspondence with the Ministry of Munitions of War and with other departments, demonstrating Weller’s various efforts to achieve military exemption. In 1921 the Ministry of Health decided that all papers relating to individual cases of exemption from National Service, including those on grounds of conscientious objection, should be destroyed, along with every tribunal minute book except those of the Central Tribunal. Thus the vast majority of files were lost, and those of Wolverhampton are among those that have not survived. Although the local newspapers, including the Express and Star and the Wolverhampton Chronicle did report on the tribunals, details of the individuals who came before them were anonymised, so we are unable to ascertain the details of Weller’s case. It is very unusual for such an item to have survived for nearly a hundred years. They were meant to shame the recipient as they were sent to people who were perceived as cowards. It is now a very rare item giving a stark and chilling alternative view of the war. 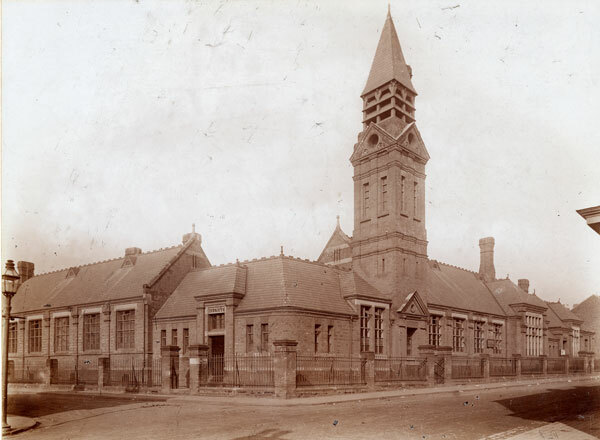 Edwin Preston Ltd. was established as a manufacturer of weights, handbells and laboratory apparatus in Kidderminster (Worcestershire) in 1853, later moving to premises in Jenner Street, Wolverhampton. Among other things, Edwin Preston Ltd supplied iron ring weights to the Army Ordnance Depot at Didcot between 1916 and 1917. As Manufacturers we shall endeavour to keep the Country going to the very best of our ability but I expect there will have to be a little give & take until we have learnt our trade. The metric system has been the German standard for many years, practice makes perfect & nothing short of a miracle will enable the English Manufacturer straight off the reel to produce with certainty articles which have taken the Germans so many years to perfect. Pricing was clearly an issue too. Correspondence from A. Gallenkamp & Co., Limited, challenged the firm. You stated that you would not be able to supply these Weights quite as cheaply as German Houses. We hope that if you go very carefully into the matter, you will find that you can do so, for we have already received quotations from Birmingham, which compare very favourably with the former German prices. Nevertheless, Edwin Preston Ltd survived and thrived, continuing to trade until at least 1981. You can view the records of the company at Wolverhampton Archives.